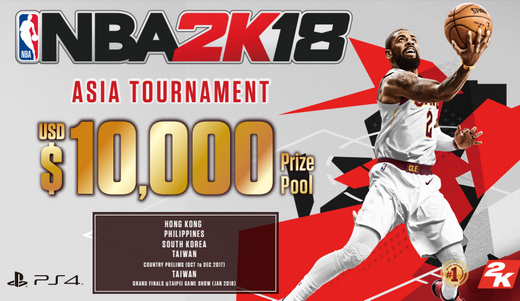 Manila, Philippines – September 2017 – 2K along with PlayStation Asia announced the details for the NBA 2K18 Asia Tournament at the Run the Neighborhood event staged by International Athletic Trading Company and Take Two. Local qualifiers of the NBA 2K18 Asia Tournament will be held in Hong Kong, Taiwan, South Korea and the Philippines. Participants will battle it out on the virtual hardwood courts between October and December 2017. The top 2 players who emerge victorious from each country will represent their nations in the NBA 2K18 Asia Tournament Grand Finals, which will be held at the Taipei Game Show in Taipei, Taiwan in January 2018. The NBA 2K18 Standard Edition will be available on PlayStation®4 system and PlayStation®3 computer entertainment system, Xbox One and Xbox 360, and Windows PC platforms. The NBA 2K18 Legend Edition and Legend Edition Gold will be available on both digital and physical formats for PlayStation®4 computer entertainment system, and Xbox One. All NBA 2K18 Editions will be available at all three NBA Stores in Metro Manila and NBA Store in Cebu as well as NBAStore.com.ph. play style on your road to a 99 overall rating. For all the latest news and updates on the NBA, visit www.nba.com and follow the NBA on Facebook (www.facebook.com/philsnba), Twitter (www.twitter.com/nba_philippines) and Instagram (@nbastoreph). *According to 2000 - 2017 Metacritic.com and Gamerankings.com.